I've briefly stepped inside another world. I'm in the Cass Business School, part of the City University, London. Walking through the revolving doors and into a glass palace, I'm catching a glimpse of the life in the kind of university campus I could have attended had I opted for business and commerce over the arts. 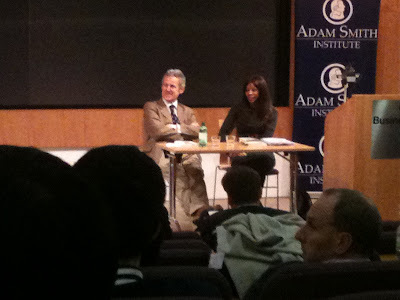 This aside, the purpose of my visit is to see Dambisa Moyo give a lecture for the Adam Smith Institute. Moyo is a leading light and a refreshing voice in the world of economic theory whose career as a writer blossomed following the publication of Dead Aid: Why Aid is Not Working and How There is Another Way for Africa - a book that strikes a major chord with my own relationship with projects in Africa and assists me greatly in my new role co-ordinating aspects of Global Citizenship into my college's curriculum. I get to a seat, instinctively at the back of the lecture hall, where I have a decent vantage point of the whole room. As the time approaches 6.30pm, the hall fills up slowly with a true cross-section of modern life - bankers, students, interested others; white, black, Chinese, South-East Asian. I guess this best demonstrates the broad appeal and 'fanbase' that Moyo has created for herself. 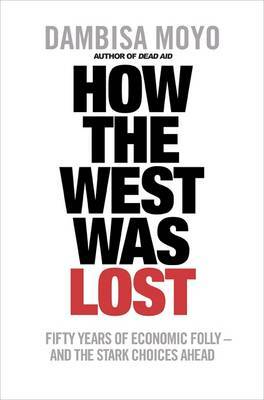 This talk focuses primarily on Moyo's new book, How The West Was Lost: Fifty Years of Economic Folly and the Stark Choices Ahead, but refreshingly still relates a lot of its content to both Dead Aid and to Moyo's homeland of Zambia. She manages to balance perfectly a combination of common sense, a passionate voice, convincing arguments, statistics and theory during her lecture without ever alienating her audience. It is safe to say that, even with my lack of business acumen or knowledge of Economic theory - not knowing what FDI meant for example - I was still able to follow the line of discussion. Over the course of the talk and the ensuing discussion, Moyo made some very good points. Borrowing from a former US General, she said that in economics, like war, we need to "start from where we are, not where we want to be," before moving on to say that governments, assisted by short electoral terms, are too quick to find "short-term tactical fixes" to win votes and are not looking at the "big picture." She went on to posit that incentives should be used to get people to do what the economy requires of them, for example, paying people to take maths and science courses - two areas that would assist an economy in a country like the UK. I must admit, as the lecture and discussion reached its conclusion, I not only felt convinced by the weight of Moyo's arguments, but also that I had learned so much more about Economics. After the talk had finished, I headed to the lobby to withdraw the money to buy a copy of How the West Was Lost only to find the cash machine not working. So, along with another listener, a young woman called Tsongana from Zimbabwe who similarly lacked any knowledge of economics but was equally convinced by what she had heard, I trekked off to find money and returned relieved to find Moyo still on hand to sign my copy of the book. I would like to thank the Adam Smith Institute for organising this free event, the Cass Business School for hosting it and, of course, Dambisa Moyo for her engaging talk and for signing my copy of the text.